Almost $4.3 million in bitcoin (BTC) is scheduled to go on auction next month. The advert continues on to relay that the digital assets were forfeited during various “federal criminal, civil and administrative cases”. The auction commences on the 5th of November and requires potential bidders to deposit $200,000 before being eligible for participation along with a plethora of other stipulations regarding registration. 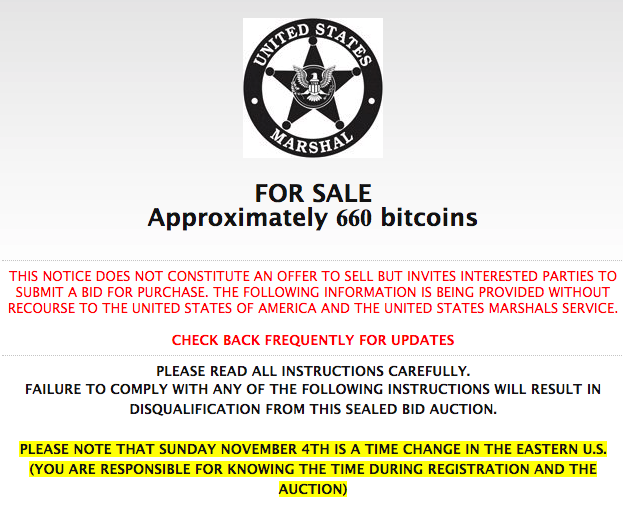 By far the biggest forfeiture mentioned came from a classified FBI administrative case of which provided 45.9999756 of the 660 BTC on auction. Also mentioned within the forfeitures was Thomas Mario Costanzo who reached headline back in August for money laundering via a peer-to-peer Bitcoin broker site; using the exchange to launder the dirty money for BTC. According to a media source, at sentencing, the judge ruled for the forfeiture of 80.94512167 BTC.